Pink Panther Travel has a fleet of four clean, smart 16 seater minibuses for your journey. 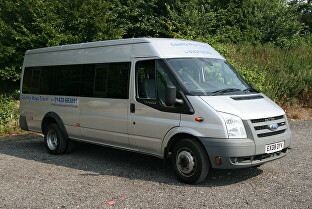 All our minibuses have forward facing seats and 3-point seat belts. Anti-lock braking systems and speed limiters are fitted as standard. The spacious mid-line interiors and contoured high back seating ensure you have a comfortable journey. Our professional drivers are smartly dressed in our company uniform and take pride in delivering an excellent service to you, the customer. Our drivers have all completed Enhanced DBS checks. We take your safety very seriously - all our vehicles are maintained to the highest standard and meet all the criteria and regulations laid down by DVSA (the government passenger transport agency).